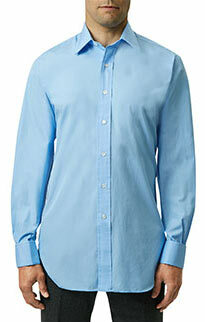 A fine cotton pinpoint in a sky blue, this shirt has a little more body than a classic poplin. The tighter, finer pinpoint weave of the shirt gives it more fomality than its parent Oxford weave and the Oxford shirt, upgrading the elegance factor. 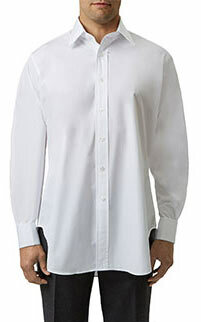 This shirt has a double cuff, keeping it fairly formal. Our classic fit shirts are a part of our heritage and represent the original, Budd shirt. They are cut a little fuller; we like to say they are the shirt of those who enjoy a good lunch. They have a very English look to them, in line with the Jermyn Street tradition. 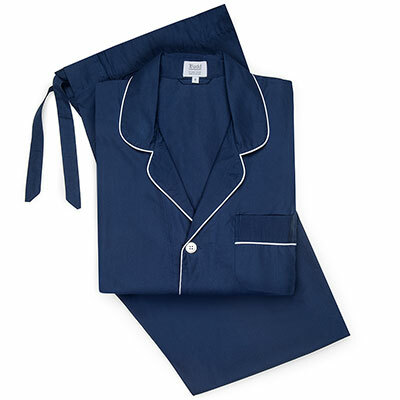 Our classic fit features our own Budd, forward collar, which is fully lined and unfused. The placket is hand folded (40mm), as are the side gussets. Perfect at work or play. A little heavier than our classic poplin shirt. Perfect at work or play. A little heavier than our classic poplin shirt. Budd forward collar. Classic, fuller cut. Double cuff. Sustainably sourced Mother of Pearl buttons. Made in England.